Will Future iPhones Rat You Out? Remember that old saying the customer is always right? Well, in the future that saying might be "the customer is always right, unless their iPhone says otherwise." A patent filed by Apple has been uncovered for a "customer abuse detection system" that would allow technicians to tell if you've been too hard on Apple devices like your iPhone or iPod. Possible instances of customer abuse could include immersing your device in liquid, exposing it to extreme temperatures, dropping it, or tampering with the device's internal circuitry. 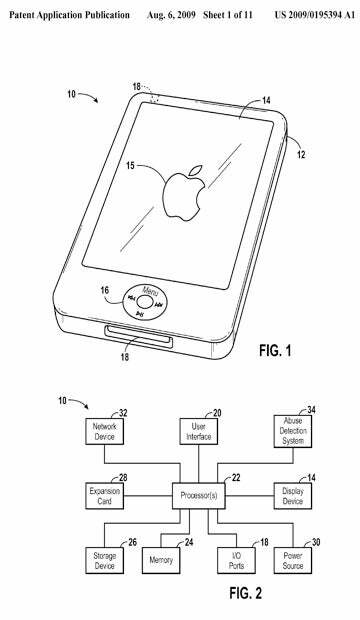 Although the patent didn't specifically mention it, I'm sure running over your iPhone with a motorcycle would also set off the abuse detection system. Whenever abuse occurs, the detection system could store a digital recording of the event in the device's memory. Then, using diagnostic tools, technicians could find out how you've been treating your iPhone or iPod. If you've been too hard on your device, Apple could be in a position to argue your warranty is void, and that you are not eligible for a free repair or replacement. The above quote doesn't come right out and say that Apple plans to use this invention to refuse device repairs or replacements, but it's hard to imagine what else an abuse detection system would be used for. A customer monitoring practice like this could be problematic, since there could be times where your device records an abuse event that may not be cause to void your warranty. What happens, for example, if you are walking outside with your device in freezing temperatures, or leave the device in your car for a few minutes on a particularly cold day? Or if you happen to drop your iPhone in liquid but you are able to quickly dry it off before the device becomes adversely affected? Then a few weeks or months later, something else goes wrong with the machine. Would Apple start refusing repairs or replacements because of a past event that may not have caused the device to malfunction? Either way, I'm not so sure it's a great idea for Apple to be essentially spying on its customers like this. Apple may save some money on repairs and replacements with an abuse detection system, but the company may regret the practice if it causes widespread customer frustration at the Genius Bar.